New Orleans police arrive to a call of a domestic dispute 36 minutes after it was dispatched. Police units arrived at 9:03 a.m., and talked to the female resident for eight minutes before leaving. A male walked away from the residence at 8:55 a.m. before police arrived. 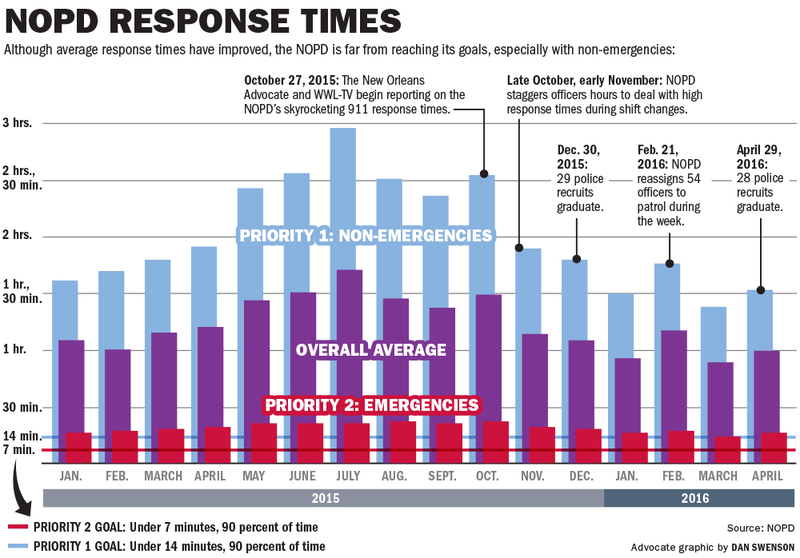 Six months after officials pledged to crack down on abysmal response times, New Orleans police are getting to crime scenes more quickly but are still nowhere near achieving the goals the department set out earlier this year. While policies aimed at bringing arrival times back under control have had a clear impact on improving the department’s 79-minute average response time, the momentum appears to have plateaued, according to an analysis of calls to police. That comes despite a variety of tweaks to the department, including taking dozens of police off desk duty and putting them back on the streets. The sheer scope of the challenge coupled with setbacks to new initiatives put in place to address the problem raise questions about what it will take to get units to scenes quickly. 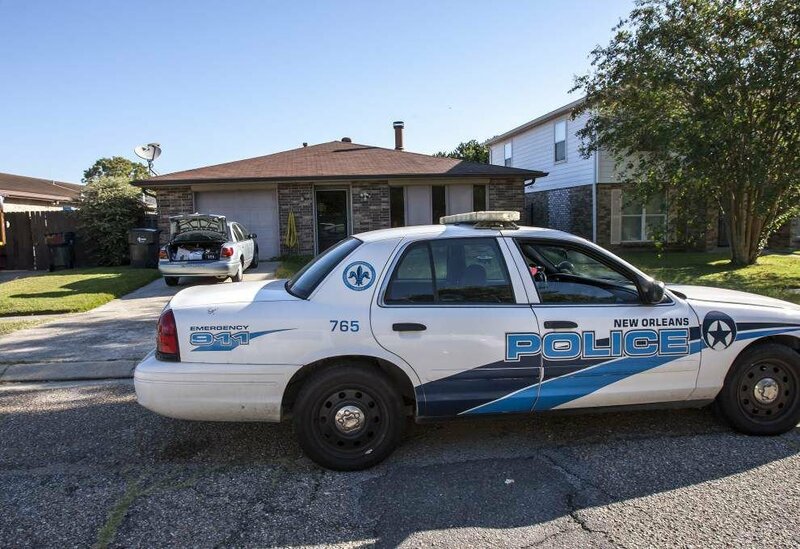 While a variety of efforts are on the drawing board, officials say continuing to make meaningful improvements likely will depend on the expansion of the New Orleans Police Department, a plan that could take years and currently has no dedicated funding. The average response time for all calls has fallen from 1 hour and 19 minutes to 1 hour, a 24 percent decrease from where things stood as of August. But that means it still takes an officer twice as long to arrive on the scene as it did at the beginning of 2010. For emergencies such as felonies and crimes in progress, known as Priority 2 calls, the average response time has decreased from about 20 minutes to about 16 minutes. In early 2010, officers would take an average of about 10 minutes to respond to similar calls. The department is still far from reaching its self-imposed goal of responding to 90 percent of Priority 2 calls in 7 minutes or less, and less-urgent Priority 1 calls in 14 minutes or less. The department hit its goal about 36 percent of the time in April for Priority 2 calls and 39 percent of the time for Priority 1. There remains a big gap between response times in the best- and worst-performing police districts. Three districts — District 7 in New Orleans East, District 3 in Gentilly and the lakefront area, and District 5 stretching from the Marigny and Bywater to above Florida Avenue — cut their response times in half but are still 20 to 30 minutes slower than other districts. Officials say there are no easy solutions to bring response times down further. Only beefing up staffing will fix the problem, asserts NOPD Superintendent Michael Harrison. “As I’ve stated, and I don’t know how much I have to say it, the only way to really fix this is to add more police officers and to bring them on really fast,” he said. The changes made by the department since fall largely have been aimed at beefing up the number of officers on patrol, either by directly moving cops onto a beat or coming up with stopgap measures to cut down on the backlog of calls waiting for a response. The most dramatic measure was changing police schedules from three platoon shifts to five overlapping ones, which added officers during the department’s traditional shift changes, a time when unanswered calls stacked up and response times would go through the roof. That policy was implemented in the beginning of November. By the end of the month, 20 minutes had been cut from responses citywide. That was followed by another initiative: having desk officers respond to nonemergency calls by phone, reducing those response times and taking a burden off the officers on the street. Another 10-minute drop came at the end of the year, but since then the numbers have remained in the 50-minute range, even as the department moved more than 70 officers from desk duty or specialized tasks to the street after Mardi Gras. As the department has grappled with the issue, another tactic has arisen. At least in some cases, officers in what are informally known as “hot cars” are being dispatched to scenes to determine whether there is an actual emergency. If not, they leave the scene and ask the caller to wait for another unit to take a report when the schedule clears up. That gets residents a fast response — and lowers the department’s averages — but also does little to reduce the overall amount of time a victim or witness has to wait before an incident is fully addressed by police. The exact effect those policies are having on response times is unclear. Harrison characterized the program as “smart deployment” that ensured officers were properly prioritizing incidents. “If there are multiple calls of multiple emergencies coming out with fewer officers, perhaps we can’t write the report right then but at least satisfy the emergency,” Harrison said. Even after the reductions in police response times, it’s not hard to find individual stories of residents alarmed by how long it took to see a cop after a crime. Two warehouse workers who fought off a gun-toting robber in the 1400 block of Montegut Street in April said they quickly called police, worried at the prospect that the robber might still be lurking nearby. The workers said they waited for what felt like 20 to 25 minutes. Police data states it took officers 12 minutes to arrive at the scene after the initial call. In a separate incident this month, a man living near the Fair Grounds Race Course wound up waiting nearly 5 hours for officers after a house burglary. Will Bercik said guests staying at his house on North Gayoso Street arrived at almost the same time as a burglar was fleeing out the back. The house had been ransacked. Both Bercik and his guests called 911 in short order, just after 3:30 p.m. on May 13. If police had arrived right away, Bercik said, he is confident they might have had a chance to catch the burglar. “Without a doubt. You don’t miss the dude wearing Tiva sandals and socks,” said Bercik, 33. But the crime was treated as a Priority 1 call, according to police logs. A dispatcher told Bercik the wait would be a while. As the hours passed, his guests left. About 5:30 p.m., he decided to make a quick run to the nearby Seahorse Saloon. “I just literally was sitting there fuming, so I went to get a beer,” Bercik said. When Bercik returned to his house, police already had dropped by and left. Having missed his chance, he called police again about 6 p.m. Then he waited, police logs show, until officers were dispatched again just before 8:30 p.m.
Bercik said he was pleased with the thorough work of the officer and detective who ultimately showed up at his house. But to him, their effort seemed a waste. “You showed up way too late to do anything beneficial,” he said. 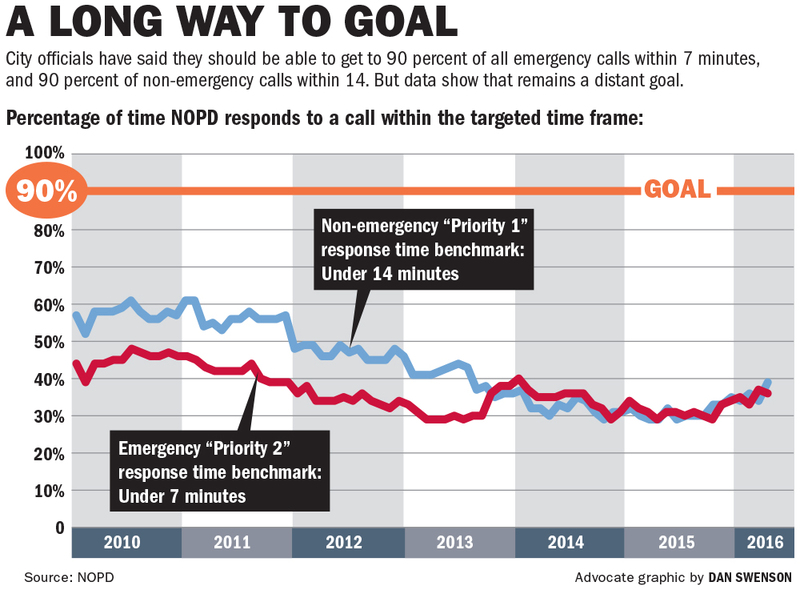 Since the initial focus on NOPD’s response times, the department has worked to integrate the statistic into its regular routines. Weekly meetings at the department on crime statistics now feature regular updates on how various districts are doing. The department’s internal benchmarks are based on a different analysis than that used by The New Orleans Advocate, making direct comparisons difficult. NOPD focuses on the median — the individual calls or calls in the middle of the range — and narrow the different categories of calls more finely. The median emergency call is now getting answered in about 9 minutes, still higher than the 7-minute goal set by a consultant, Berkshire Advisors, at the beginning of the year. “That’s not acceptable. Because we set a goal, and we’re always trying to reach that goal,” said Harrison, echoing comments he made as the crisis reached its height last fall. The department has slid from a peak of 1,600 officers to about 1,165 today but is closing in on increasing patrol officers to 319 as recommended in the Berkshire report through its internal reorganization. While the department is working toward hiring a total of 150 officers this year, those would go to other divisions in the department. How much the NOPD can grow beyond this year is up in the air, thanks to an April vote in which residents shot down a property tax that was to pay for further expansion. There also have been other hurdles. Earlier this month, the state Legislature killed a bill that would have relieved officers of the requirement to investigate minor car crashes, instead allowing them to take reports online or over the phone after the fact. The Landrieu administration, which made the bill a priority during the ongoing legislative session in Baton Rouge, estimated it could save officers between 3,000 and 10,000 hours of work a year, time they could be responding to other, potentially more critical calls. But it never made it out of committee after the insurance industry lobbied hard against it. “It’s not a little frustration; it’s great frustration,” Harrison said of those setbacks. Another program aimed at lowering response times still is in the works, though its not been rolled out yet. The City Council last year passed an ordinance that would penalize properties that repeatedly are sites of false burglar alarms, which officials argue take up a large portion of officers’ time. Other tweaks that have been proposed include going to an electronic system for tickets and warrants — to save the time needed to travel to fill out the paper versions — and allowing cops to gas up their units at more locations throughout he city. “All of these new initiatives are all part of putting more cops on the street, keeping more cops on the street, improving efficiency,” Harrison said. Advocate staff writer Matt Sledge contributed to this report.